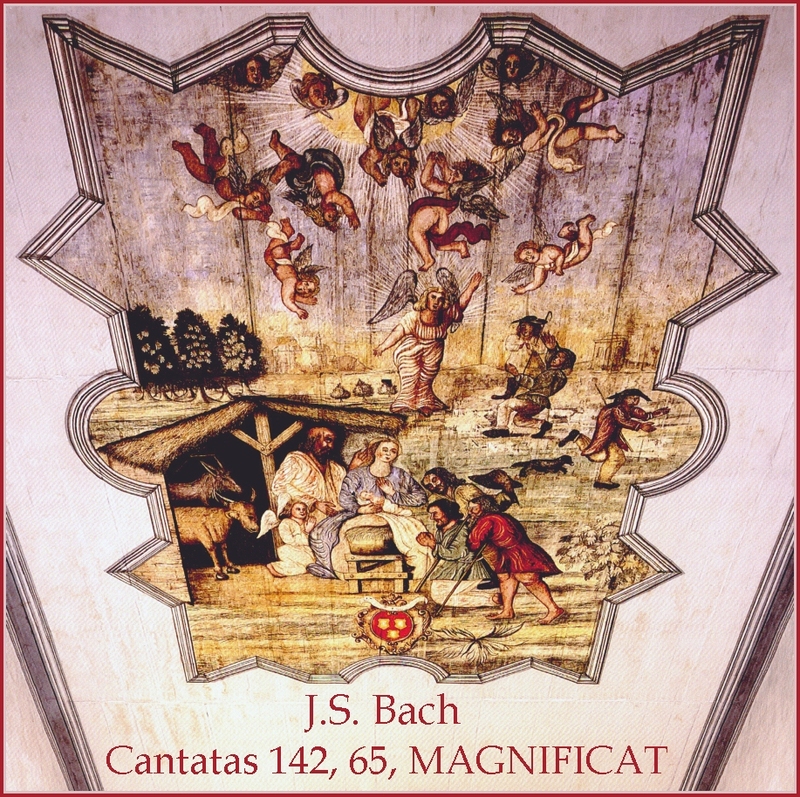 Cantata BWV 142: Uns ist ein Kind geboren – For unto us a Child is born. Friedrich Melzer, Tenor / Edmund Illerhaus, Bass. Peter Schreier, tenor / Barry McDaniel, bass. 1 1. 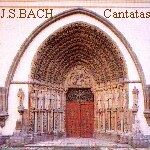 Cantata BWV 142: Uns ist ein Kind geboren – For unto us a Child is born. These three works are focused around the Christmas festival, though one can enjoy them at any time. Our first cantata, BWV 142: Uns ist ein Kind geboren – For unto us a Child is born, a cantata for the first day of the Christmas Festival, was composed at Weimar, probably in 1712 or 1713 with a text by Erdmann Neumeister. 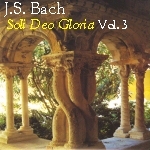 It is scored for alto, tenor and bass soloists, a full choir, two recorders, two oboes, first and second violins, viola and continuo. 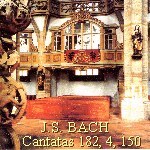 It is a joyful cantata, composed in a musical environment which Bach found pleassant and conducive. 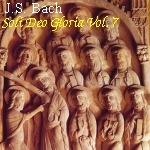 The mood of this cantata is joyful, yet purposeful, its fugal opening setting the tone. 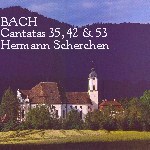 Some Bach scholars have raised doubts as to whether this cantata is by Bach; we have no such doubts. 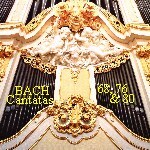 This is followed by Cantata BWV 65: Sie werden aus Saba alle kommen – They shall all come out of Sheba. This Advent cantata tells of the visit of the three Wise Men from the Orient, coming to present their gifts to the new-born Christ in the Bethlehem stable. 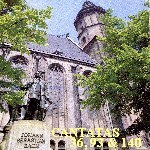 First performed on January 6th, 1724, the Festival of the Three Kings or Dreikönigsfest which brought to an end Bach's first Leipzig Christmas, the cantata is scored for tenor and bass soloists, full choir, two recorders, two oboi da caccia, two horns, viola, cello, double bass and continuo. 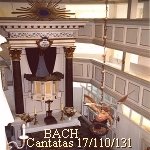 Bach was responsible for music in both the Nikolaikirche and the Thomaskirche, as well as St Paul's University Church. 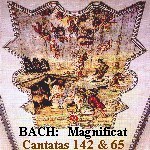 The schedule for December 25th, 1723, called for a 7 am Mass in the Thomaskirche with Cantata 63 and Sanctus BWV 238; a 9 am Service in St Paul's, again with Cantata 63, then a 1.30 pm Vespers with Cantata 63 again and a Magnificat. 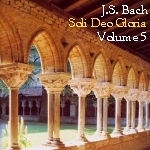 The custom of interpolating Christmas verses within the text of the Magnificat was already well established by Bach's time. The main choir would have sung as usual in the organ loft at the west end of St Thomas' Church; there was also a smaller organ and tiny choir gallery clinging to a high wall opposite the main organ/choir gallery, known as the Swallows' Nest. It was from here that the Christmas Verses would have been sung by a secondary choir. The verses most probably described the scenic presentations of the Christmas story, such as are still made, often by children, for our churches today. 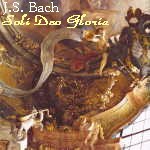 Ten years later, in 1732 or 33, Bach revised the Magnificat, transposing it from E Major to D Major, one of the standard trumpet keys, and making some other instrumental alterations, for example, replacing recorders with the (then) more modern transverse flutes. He also deleted the Christmas verses, thus making the Magnificat suitable for performance at any time during the Church Year. For our present performance of the Magnificat we have used the later, D Major version, but have retained the Christmas Verses.